I am so tired..... my eyes are really weary and aching...and I want to go to bed. Students get to display their skills, music, craft and a bunch of other cultural things... DID I MENTION THAT THE FOOD IS THE BOMB!?! The second photo belongs to me but I'm not sure who this first photo was taken by, I found it on one of the university's pages, and I decided to share it! 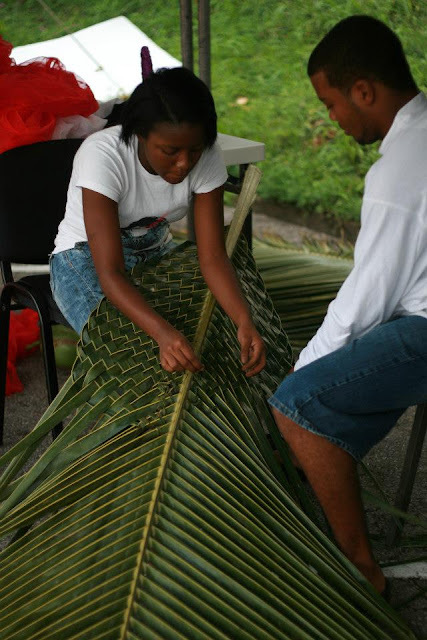 It took us hours to weave these coconut fronds. My hands were so sore but it was worth it because the end results were really LOVELY! We used them as decorative pieces for our display and sales booth, I've known people who have used them as decoration for tropical themed parties and other events. I'm off to bed before I fall asleep and start drooling on my laptop.... haha I'm gross, I know! Ohhh...... I forgot about these photo's! Tomorrow (well ummm I guess it's Today already) is Divali a public holiday here in Trinidad and Tobago, it's known as the festival of lights and is the biggest of all Hindu festivals. I missed seeing the lights last year and promised myself I wouldn't this year. I have to break the promise....I'm really upset with myself....I think I'll stop talking to me for a while. Buss-up- Shut .We had never been, so it took for ever to find the place and WOWZA... the line was super long and it kept growing and growing. It took us over an hour to make it to the front but it was worth it....the Buss-up-Shut was great we couldn't help nibbling on it as we walked!